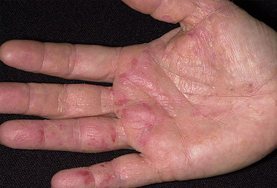 Eczema is a disease characterized by skin rashes that have redness, swelling, itching, dryness, and flaking. The skin itches and when scratched, results in a rash. In Ayurveda, this disease is known as Vicharchika. It occurs when the immune system becomes unbalanced. Genetic factors, debility, climate, and psychological factors can dispose one to the condition. According to Ayurveda, Eczema or Vicharchika is caused due to a faulty diet and lifestyle, which leads to impairment of digestion and aggravation of Pitta Dosha (Ayurvedic humor representing Fire). Pitta manifests in the skin and causes accumulation of heating toxins known as ama. These toxins accumulate in body tissues, contaminating them at a deep level and causing Eczema. Use of local creams, antibiotics and steroids only mask the symptoms; they do not affect the root cause of this disease and that is the reason why this problem often reappears. Ayurveda recommends an individualized treatment plan for patients of Eczema, including proper diet and specialized herbal combinations. The line of treatment works on pacifying Pitta by enhancing the body’s digestion, as well as cleansing the body of accumulated toxins. Sunbathing is beneficiary as it kills the harmful bacteria. Turmeric powder can also be used in natural eczema treatments and you could make a paste with a tablespoon of the powder mixed with the same proportions of bitter neem leaves. Another useful and easily available ingredient for eczema treatment would be papaya. Mashed papaya seeds can be applied to the areas of skin that are affected to reduce the itchiness. Application of mud pack over the eczema is vet helpful in avoiding eczematous condition. Taking sunbath is another means to avoid eczema. Spearmint leaf juice is also effective in treating eczema. Apply camphor paste and sandalwood paste on the eczema to get the wonderful results in eczema. Seeds of papaya is mashed and made into the paste form helps in reducing itching and irritation on the affected part. The effective remedy for Eczema is to make a fine paste by adding 1 tbls of turmeric powder and 1 tbls of bitter neem leaves and applying this paste on affected areas. An effective Eczema home remedy is called when you add an equal quantity of carrot juice and spinach juice and apply it on the affected eczema area.